Do Your Security Officers Need Tasers? The company formerly known as TASER and now known as Axon has created the market standard for what are formally called conducted electrical weapons (CEWs) or electronic control devices (ECDs). Axon says that over two-thirds of law enforcement officers around the United States carry its device. While Axon sells TASERS to the public, the market for their use by security officers is less well known. Axon sells two versions of its device to the public, which can be used by security officers as well, for $400. The company will provide training to licensed security companies, using its 2 1/2-day teaching format (4 hours online and 2 full classroom days). It offers a basic instructor course, so security guard firms can train their current officers and new hires, and a master instructor course, so guard firms can train other guard trainers. The course subjects include how the TASER works; how it incapacitates a subject’s neuromuscular system; safe use of the device, including the required medical care a subject may need; legal and liability issues; how the cartridges work and how the probes deploy; use of the device in tactical situations; training and use of force policies and postincident use issues; and plenty of demonstration and use drills. While the law enforcement use of CEWs has grown significantly in the last 2 decades, private security firms have not followed suit. Some clients of the guard companies may be reluctant to see security officers assigned to their facilities carrying CEWs, because they don’t understand how the devices work and are concerned about injuries and liability. They may be more comfortable with the contract security officers carrying batons, which actually rank higher on a scale of use-of-force weapons capable of causing serious injuries or deaths than CEWs. And while the guard’s use of oleoresin capsicum (OC) pepper spray on a combative subject in a confined space like a small room, bus, subway car, or alcove could have significant health impacts on bystanders who get cross-contaminated, CEW uses are much easier to control in the hands of trained and certified guards. The risk of death from CEW use is quite low when compared to the number of recorded deployments, and it happens most often to subjects who are under the influence of drugs and alcohol, have significant respiratory or obesity issues, or exhibit what is called “excited delirium,” which is often a combination of a number of these factors. Trained security officers will know to recognize these factors before using a CEW. Although it’s the company’s titled brand name, to use a “TASER” has become as common as other company trademarks like Kleenex or Qtips. Axon has been vigilant about protecting its brand name and has sued or issued cease-and-desist letters to competitors with similar-sounding names. 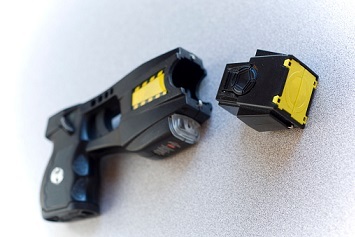 The name TASER came from its founder, Jack Cover, a physicist, who called his invention the “Thomas A. Swift Electric Rifle” after his love of the Tom Swift science fiction novels from the 1900s.